We understand that a positive and uplifting atmosphere can set the tone for a resident’s stay. 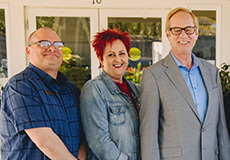 Sonoma Hills Retirement Community employs outgoing and friendly professional staff to create social programs and activities for our residents. Each resident is given a calendar to keep them informed of upcoming events such as birthday parties, movies, musical programs, outings, and other special events. Friends and family are always welcome to visit and attend our special events. During weekly activities, one can find our residents taking gentle stretching classes, fit and fun exercise, or enjoying a fun-filled scheduled activity such as bingo, poker or our in-house movie nights. Our weekly excursions are exciting and offer our residents many adventures to choose from. Sonoma Hills is a wonderful Retirement community. My Mother has lived there for over 2 years and I highly recommend this community. All the staff is great especially the Director, Mark Nilsson. He has always been very fair and helpful with my Mom and with her lease.